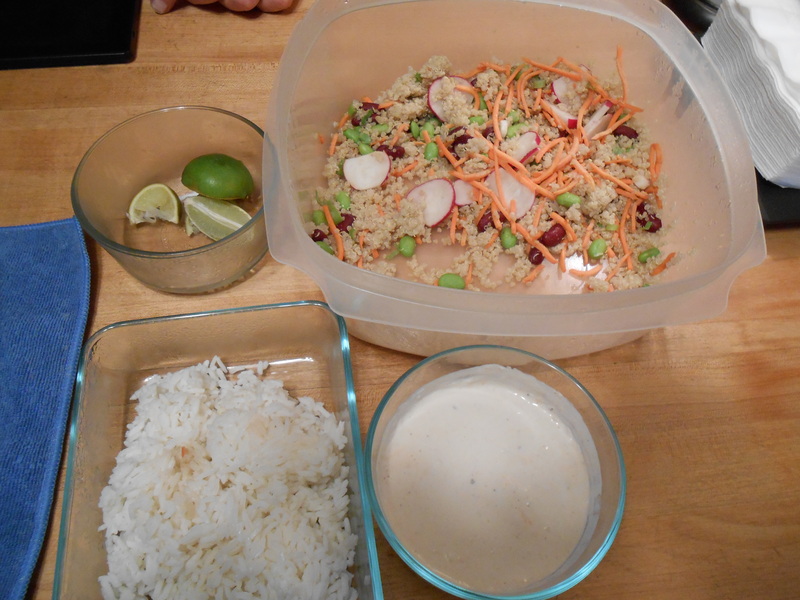 I made quinoa for the first time last week. And while we loved it I have to say it was a bit deceiving. You see it’s these little teeny tiny grains that look like they aren’t going to amount to much, so I made the entire box and it made a mountain of quinoa. We really liked it and we had it for lunches and dinners for what seemed like forever. Needless to say that we got quinoa(ed) out. It’s in the larger bowl, but all you can really see is the radishes, carrots, and edemame but there is quinoa in there too. A few more lime slices got tossed. One of the things I struggle with is sauces. I made tenderloin bites last week and I made a yogurt horseradish dipping sauce to go with them. I tend to make too much sauce from time to time, so it got tossed out too. About a cup of rice that never got repurposed went too. This has not been a good week for waste. I’ll admit that it is harder to stay on top of everything now that I’m working longer hours, but being able to report it here at least help keep me honest about it, and keeps it a little better than it could be. Most of this stuff went into the compost bin, and some got tossed in the yard to feed the birds, which makes is not as bad… But, I’m still a bit disappointed in our waste this week. How about y’all. Are you finding ways to reuse, repurpose and recycle? Posted on April 16, 2014 by LoriPosted in Compost, Recycle, Repurpose, Reuse, Waste, Wednesday WasteTagged Waste, Wednesday Waste. Previous Previous post: The BEST Steaks!!! Next Next post: What My Parents Gave Me For Easter….